The gates of the carabiners clipped into the pro should be down and out, or the gates should be down and facing to whichever side minimizes the risk of the gate being forced open by a rock edge or nubbin during a fall. 9 Rope should be run from the climber through the carabiner without twists and kinks. 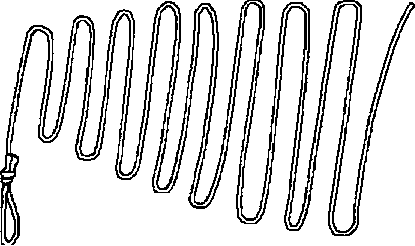 9 When using a runner, be sure the runner is not twisted before clipping into the carabiner; otherwise, the carabiner may end up facing the wrong way. 2 (10 Min) NATURAL FEATURES AS PROTECTION. 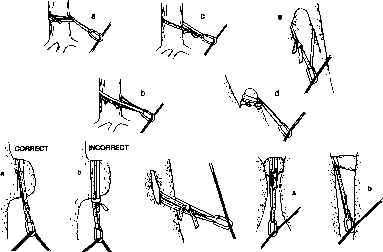 Natural features offer some of the very best protection but should always be tested for stability as discussed in NA TURAL AND ARTIFICIAL ANCHORS. 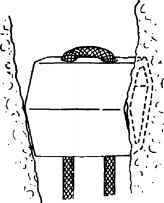 Locate the central root and construct the anchor as near to the base as possible to avoid leverage. 9 Rocks and Boulders xtreme caution should be used when utilizing rocks and boulders because of the danger it poses if it should come loose. Always ensure that the intended stone is well embedded or is too heavy to move. ^Bplace the runner at the base of the stone to prevent possible leverage. HBSpikes and flakes often provide good placement. A runner is attached by placing it over the spike / flake as near the base as possible. 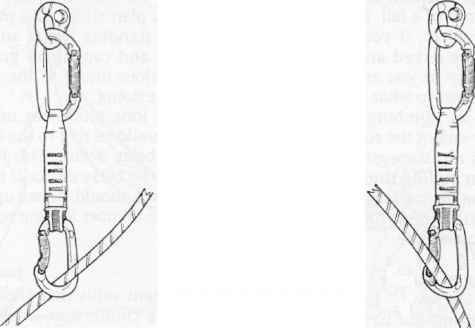 Sometimes, to prevent the action of the climbing rope from pulling the runner off, it can be attached to the spike / flake with a girth hitch. ^gWhen possible, avoid placing the runner where it may be pulled against a sharp edge of the rock in a fall. When this is unavoidable, padding sharp edges with another runner or other soft material may be helpful. HBRunners can be can be threaded through the holes or placed around the chockstone and clip a carabiner into both looped ends. 31 (15 Min) ARTIFICIAL PROTECTION. In the absence of natural protection, climbers will use artificial protection devices known as chocks, spring-loaded cams and bolts. 3 Chocks. The principle in placing chocks is deceptively simple; find a crack with a constriction at some point and place a chock of the appropriate size above the constriction and pull down on the loop to set the chock. Chocks can either be passive, meaning it sits in a constricting crack until it takes a load then wedges itself into the crack. Or it can be camming meaning that the chock is placed in a crack in such a way that when it takes a load it tries to rotate. The rotation causes the chock to cam and lock into place. However simple in theory, placing chocks require a good eye and some experience. There are basically two different types of chocks used at MWTC, wedges and hexcentrics. )Wedges. 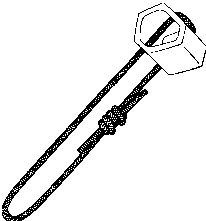 This is a passive chock that is also known as a stopper, wire or nut. A wedge chock has a wired loop attached to it and is tapered down from top to bottom so that it can fit into the constriction of a crack. It is constructed to have a wide side, the strongest side, and a narrow side. The goal is to get the greatest possible contact between the chock and the rock. ^^Hexcentrics. These chocks can be used in either the passive or camming mode and are also known as hexes. 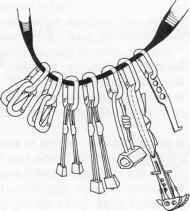 Hexcentric chocks have a wired or Type I cordage loop attached to it and have six different sized sides that are tapered, allowing it to be placed into a constricting crack. W)When possible, avoid cracks that have crumbly or deteriorating rock on one side. Many cracks that look good could have a small, loose flake on one side; often well disguised with grass and dirt. Some very tempting cracks are in fact formed by a detached flake against a large mass of rock. CWhen attempting to place a chock, always look for a likely constriction in the crack first, then select a chock that will fit, rather than selecting a chock and looking for somewhere to put it. BflWhen a place is found, choose a chock that will have as much surface area as possible in contact with the rock. A chock with just one side resting on a small crystal is likely to be unsound and unsafe. A chock that sticks partially out of a crack is usually poor protection. If the crack is too shallow to get the chock all the way in, use a smaller chock or find a deeper portion of the crack. 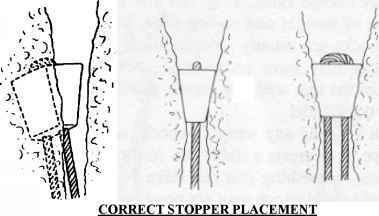 )Wh en placing a #1 or #2 stopper, always back that piece up with a secondary piece of protection as soon as possible. )Outward flaring cracks are a problem. A few types of chocks are specifically designed to fit in flaring cracks as long as the angle of the flare is not too great. g)Horizontal cracks can take simple placements if the interior of the crack is wider than the edges at some point. If not, a placement of stacked chocks may hold. In either case if the chock is on a rope loop which runs over a sharp lower edge, as often happens, it cannot be depended on to hold a hard fall, for the loop may be cut. If it is on a wire it is usually safe. 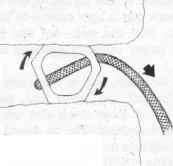 ^HWhen placing a chock with a rope loop, the side of the loop with the knot should face out when there is a choice, in order to ensure that at least one-half of the loop fits into the crack. When the loop will not fit into the crack at all, a wired chock is usually a better choice. Once a chock is placed, the climber can either clip the climbing rope into it directly or extend the chock loop with a runner. 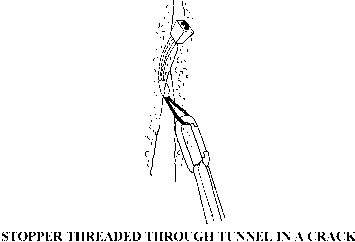 The loop of a wired chock is always extended with a quick draw to prevent "walking" the pro out of the rock. Ensure that enough quick draws are carried to use on placements. b| Spring-Loaded Camming Devices (SLCD). This is a mechanical device known as quadcams or camalots. The four cams in a spring-loaded camming device, also known as lobes, are connected to a trigger mechanism. Pull the trigger and the cams retract, narrowing the profile of the device so it can fit into a particular crack. Release the trigger and the cams again rotate outward expanding the profile until the cams grip the sides of the crack. SLCD's provide reliable placements in cracks where ordinary chocks are difficult or impossible to place; such as parallel-sided cracks, flaring cracks, and cracks under roofs. They can be placed quickly and make it possible to do some extremely difficult pitches that are otherwise virtually impossible to protect. )Care should be taken to ensure all individual cams of the SLCD have a good purchase on the rock. If one or more cams have no purchase, this is considered improper placement, and an SLCD can easily be pulled out of the rock when a fall is taken. preventing the SLCD from performing properly. It may also be impossible to remove. Use a smaller one or another type of pro. )Avoid under camming, where the cams are over expanded causing the cams to rock on its tips; also known as "tipped" placement. 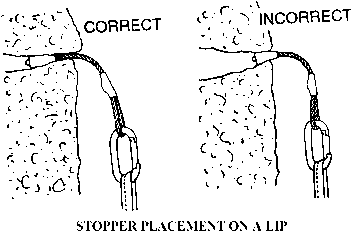 ^P)Do not put the SLCD any deeper into the crack than it has to be for a good placement. If placed too deeply, it may be impossible to reach the trigger to remove it. 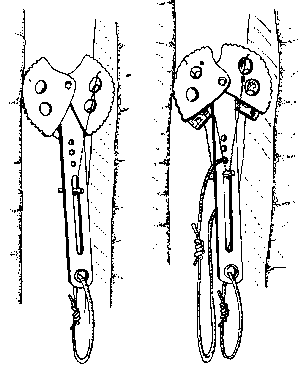 KfWhen placed behind flakes or in deep cracks, SLCD's have been known to "walk up" into the crack out of reach as a result of rope action. A SLCD should be extended with a runner in such placements to reduce the possibility of the pro walking. ®)Always align a SLCD's stem and cams in the direction of pull. )Fixed bolts are often found in civilian rock climbing areas and are not uncommon on alpine rock climbs. Bolts are most commonly used for belay anchors, but also provide protection on otherwise unprotected stretches of rock. )Bolts generally provide the best and certainly the most convenient protection. Unfortunately, they are not always sound and should be checked. Bolts can be checked by examining the rock around them for evidence of crumbling or cratering, and they should be tested by clipping into them with a separate carabiner and jerking on it before clipping in the rope. Never hammer on a bolt to test or improve it, since this will permanently weaken it. 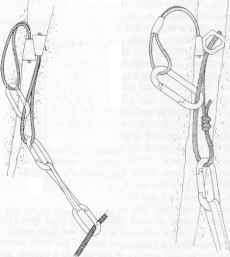 )When clipping into a bolt, it is best to do so with a carabiner-runner-carabiner combination, known as a "quickdraw", which will reduce rope drag. TRANSITION: Now that we have discussed placing protection, are there any questions? Next, we will discuss clipping in. Ensure that the gate of the carabiner is facing away from the rock, especially near books and edges. If necessary, extend the protection with a runner. (HE When traversing left of the protection, the gate will face toward the right. (2) When traversing right of the protection, the gate will face toward the left. (3) When climbing straight up, the gate direction will not matter but ensure that it is facing away from sharp edges. c. To clip the carabiner, grab the rope from your retrace figure of eight and pull up a bight. If a bigger bight is necessary, hold the rope between your teeth and pull up a bigger bight. d. Always clip the carabiner from the rear to the front. This will prevent the rope from backtracking over the gate causing it to unclip during a fall. This is also known as "The Death Clip". e. The carabiner should allow the rope to run smoothly without twists or kinks. Always inspect the run of the rope through the carabiners to ensure against "Z" clips. f. When this is done correctly, the rope going to your retrace figure of eight should be coming out of the front of the carabiner. The rope going to the belayer will be between the carabiner and the rock. TRANSITION: Are there any questions over clipping in? Next we will discuss the racking of equipment. INSTRUCTOR NOTE: Have students take their full racks for the first couple days of climbing until they learn what they need to take. a. Rack several pieces of pro of the same size on one carabiner, arranging these on the rack in order of size. This has the advantage of having extra pro on hand if you don't get the placement right the first time. b. 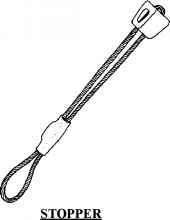 Long slings are worn by doubling the loop over and clipping both ends with a carabiner. c. Quick draws are preset carabiner and runner combinations that allow quick and easy extension of a piece of protection. It is helpful to have the gates of the carabiners opposite of each other so that the bottom carabiner is down and away from the rock. This makes clipping in much easier. 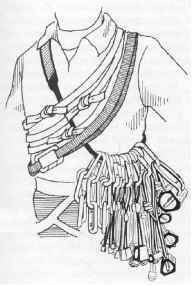 Other item such as a stitch plate, rappel gloves, chock pick, etc., need to be placed at the back of the harness. TRANSITION: Now that we have covered racking equipment, are there any questions? Are there any questions over the amount of gear? If you have none for me, then I have some for you.